Located in southern California, for many years Sierra DBC held one of the first Dachshund specialties of the year in January. Starting in 2018, we are holding 2 Specialties on the same day in May preceding and at the same location as the Mission Circuit! Please refer to UPCOMING EVENT INFO for more exciting details. Our annual Puppy Match will be held on TBD 2020 at Canyon RV Park (Anaheim) in conjunction with Dachshund Club of Santa Ana Valley, Inc. match and Earth dog event. Truly a day of fun with our Dachshunds and friends, see our UPCOMING EVENT INFO page for more information on all these events. Club meetings are held approximately every other month at various locations to accommodate all of our members. Our ANNUAL CLUB meeting is held in January. Our next meeting is scheduled for Sunday., May 5, 2019 at 2pm. Current location of meeting: Marie Callendar Restaurant. 2149 E Convention Center Way, Ontario, CA. Guests are welcome, but RSVP is strongly recommended (members and guests). MEMBERSHIP: If you are interested in membership, please email our Corresponding Secretary for more information. A Membership Application (word.docx) is available for your convenience. Applicants must be sponsored by 2 active club members. ​Visit our UPCOMING EVENT INFO page for upcoming events and premiums! SDBC hosts our Annual Specialty, Field Trials and Earthdog events! 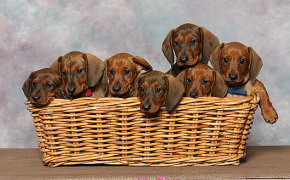 Come join in the fun with our dachshunds and their owners! Results from our events is listed on our Event Results page. our Members Breeder Referral Page has information to assist you! Sierra Dachshund Breeders Club of Los Angeles Co (SDBC) has made every effort to insure the accuracy of this information, provided “as is” with all faults and without warranty of any kind, expressed or implied. In no event that the Editor or any SDBC Executive be liable for any individual or consequential damages, lost profits, or any direct damages even if SDBC has been informed of the possibility thereof. Linked publications/article and/or sources are the sole responsibility of the author(s).